As Chicago’s leading eye care specialists, we offer unmatched eye health expertise, quality eye treatments, and effective surgeries and procedures. Since 1968 we’ve served over 30,000 patients, all treated with skilled, specialized care. Whether you need a simple eye exam, are suffering from a degenerative ocular disease, or need emergency eye treatments for an infection or injury, we’re here to serve you. Our team of licensed and board-certified ophthalmology surgeons will ensure you feel at ease during your visit and are happy to answer all of your questions. Contact us today to schedule an appointment. Our certified professional staff offers decades of experience in ophthalmology, and together have performed over 50,000 procedures. Trained on the most advanced technologies today, Dr. Gerstein and his staff can recommend the right treatment for your specific circumstance. We specialize in comprehensive eye examinations, ocular disease treatments, ocular surgeries, and offer effective, affordable eyeglasses and contact lenses. 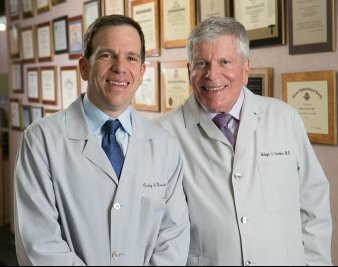 We’ve built a reputation in Chicago, IL, over the last 50 years, for quality eye care, affordable prices, and unmatched medical expertise. No matter the age of the patient or their medical background, we’ll help them feel at ease during their visit. Call us today to find out how we can best serve you. We can diagnose ocular degenerative diseases before they cause permanent damage, and we offer prescription strength eye medications for common ailments like pink eye or other bacterial infections. When you need reliable eye care from a team of trusted medical professionals, Gerstein Eye Institute is your first, best choice. Our full-service facility offers general eye exams, a fully-stocked shop for eyeglasses and contact lenses, an ophthalmologist facility, and exceptional optical procedures. For the convenience and safety of our patients, the Gerstein Eye Institute features an on-site, accredited surgical facility. Our surgery center is one of only six eye care surgery centers in Illinois that is state-licensed, Medicare-approved, and accredited by the Accreditation Association for Ambulatory Health Care, Inc. (AAAHC). Unlike the impersonal atmosphere and complicated registration procedure at hospitals, our patients experience greater privacy, more individualized attention and reduced exposure to hospital-borne pathogens. They also enjoy a friendly atmosphere where highly skilled professionals provide the personal service patients deserve. Contact us today to find out if ocular surgery is right for you. Call us today for more information on our facilities.